Waking up at my uncle's house, we were conveniently located within 5 minutes drive to our first fishing location. This was a set of canals where Cobra Snakehead had been established. However, they were not very cooperating in winter months last year...and they were not cooperating this winter either. Ben and Michael had one hit each that did not result in a hook up. They didn't feel it was worth the time and effort to continue on the hunt, so we decided to end the session early. By 11:30pm, we arrive at another canal further south just to see Martini with a bent rod. 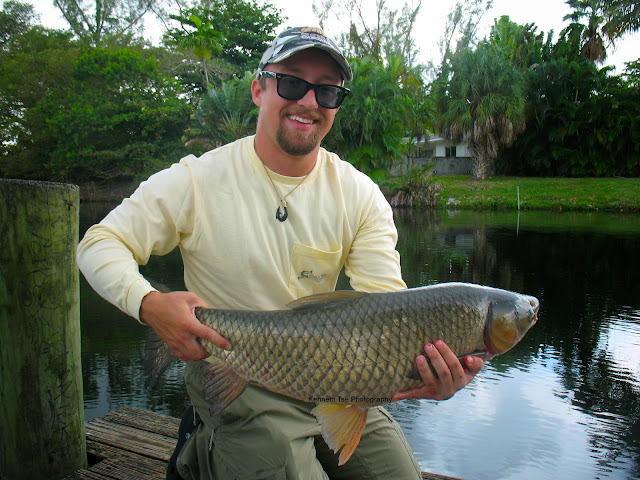 We arrived in time just to net a nice Grass Carp for Martini. There were Blacktail Cichlid in this canal, but once the small school of cichlid saw us coming, they left the area. We tried for a while to fish blindly under a float. At one point, my float dipped down slowly and we thought it might be the right kind...but we found a turtle at the end of the line. 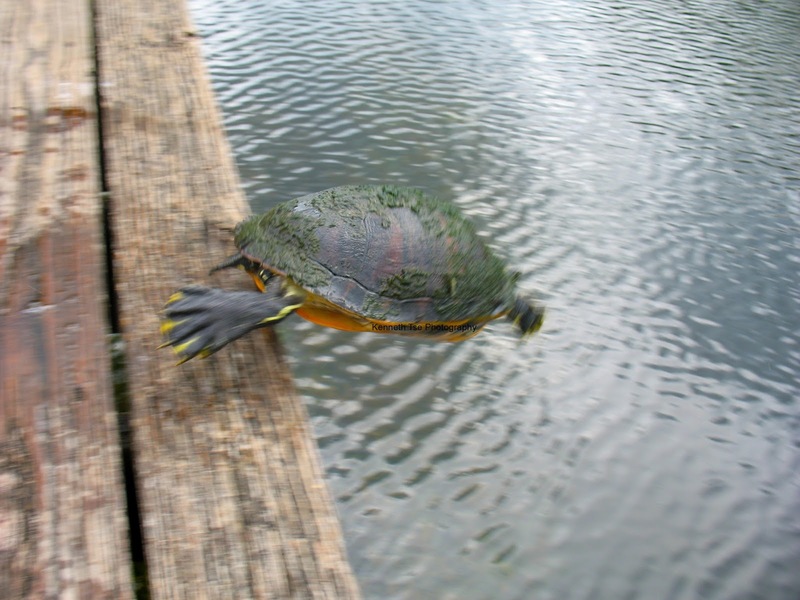 I didn't know turtles could run so fast to launch itself off the dock. It was very comical. We fished another spot further down the canal. Ben might have hooked and lost a Blacktail Cichlid, but without landing the fish, it was hard to say for certain. After spending 2 hours on this canal, it was time to fish another canal for another species. I really wanted to catch a Hornet Tilapia on this trip, especially when Martini had a really good spot to find them. While Michael and Ben both caught their lifer Hornet Tilapia, I was plagued by bluegills competing for my bait and all I had to show after an hour of fishing were two 9" bluegills. At least I now know where to find the Hornets. It was about 4pm when we arrived at our 4th fishing spot of the day. This was a set of canal on a particular university campus. The water was brackish and there was an interesting mix of species. We saw Spotted Tilapia, Mayan Cichlid and even a non-cooperative Blacktail Tilapia (I tried to get it to bite). 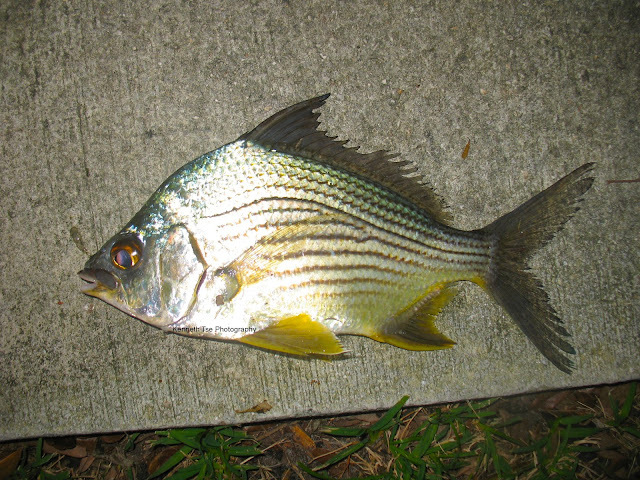 Furthermore, there were Striped Mojarra, Mangrove Snapper, Jack Crevalle and even a Common Snook! The one species that attracted my attention was the Striped Mojarra. We could see the school swimming around. I've never had trouble catching mojarra species, but these fish were very wary. 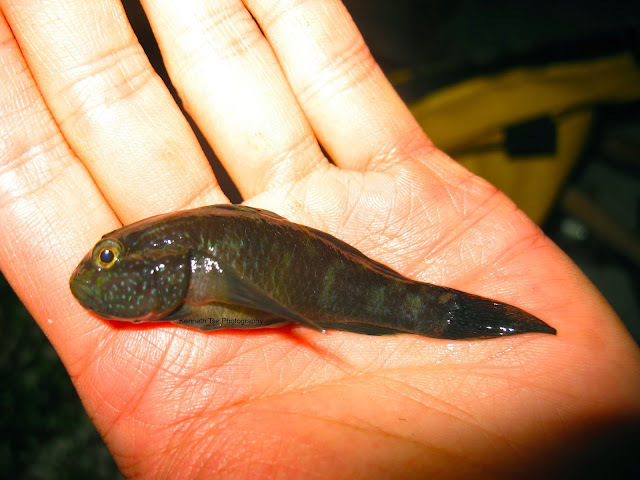 Finally I figured out that the Mojarra in the depths of the canal were much less wary. In no time, a freelined chunk of shrimp tail nabbed another lifer! Next in my sight was the Crested Goby. Ben had already caught many of them at this location already. It would have been fairly easy if it wasn't already dusk and I was stuck with my prescription sunglasses. I had left my regular glasses in the car and there was no time to get them. Luckily, I caught my Crested Goby before it was too dark to sightfish for them. It was too dark to use the photo tank on this goby...so this was the best picture I could managed. Once dark, we had to be on our way toward the Florida Keys. We bid farewell to Martini. He was great fun to fish with and his knowledge on Florida species was endless. We certainly will be fishing together again in the future! We rushed to the BassProShops in Islamorada, Fl just in time to get a pier net. Miciah was already there waiting for us. I met Miciah for the first time in May when we fished in Illinois. It was great to see him again. We made a quick dinner stop in Marathon, FL since we hadn't had a bite since 8am in the morning. I love McDonald's pie...and this special Holiday Pie was a great custard pie! We got a bunch of bait including squid, shrimp and frozen herring at the Winn-Dixie supermarket. You can get bait at any of the supermarket in the Keys. It was convenient since they open until 12am. Once we were set up at our bridge location, it was already 10pm. We chatted with someone who had just landed a 6' Bull Shark on the slack tide. It certainly had us excited. We quickly caught some grunts for bait and sent them out. The current was strong and the water murky for most part of the night. The wind was also relentless the whole night. This would be the pattern in the Keys for most of our trip - strong current, murky water and windy. According to one of our online friend, this was not ideal condition to fish the Keys. It was not surprisingly that our lines were silent all night. Ben, Ruoxi and Miciah went to bed early, but Michael and I stayed up until 3am checking bait. At the end, I needed at least a couple hours of sleep since we had a day of kayak fishing ahead of us.